I love birthdays, the annual reminder that life goes on. So when one of your childhoods most potent memories , your school, turns 150, it's reason to bring out the party caps and balloons. As a countdown to the main event in January, the school alumni would be organising a host of events. 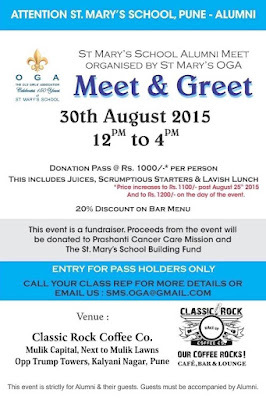 The first of which was a luncheon 'meet and greet' at 'Classic Rock' in Pune. the invites, sent in the new age whatsapp messenger service, done in the school colours of white and blue. The event was a lovely way to get to know the history of the school as lived and breathed by the 'Old Girls' themselves. Met a lady from the batch of 1963 who carried these black and white pictures of the then uniform. a skirt with sash, which was chsnged to the now pinafore version in the year 1973-74. the colours were white and blue back then as well, and from the pictures I could see that even back then the girls found innovative ways to hitch up the skirts to show 'some leg'. If I back calculated and these 'girls' passed out in 63, means they were around 16 at the time, they were born the year India got Independance! They even attended the schools centenary celebrations. No foodie trail is without a mention of food. mushroom fritters stuffed with cheese. oozy cheese, melt in your mouth mushrooms, and a crispy csrumb exterior made for great finger food. tables laden with drinks, it sure was ahappy getting together of St Maryites down the years. Meher, from the batch of '82 dressed in the school uniform was the belle of the ball. I love the way we were on 'first name ' introductions with just the addition of our batch year as introductions at the meet and greet. me? I am Kuheli from batch of 2000, glad to meet you. The rocking Batch of '82 was all dressed in combinations of blue and white, and also won the batch with maximum representation at the meet, with 14 of their alumni. Food again, the Biryani was supposedly the signature dish at Classic rock, I preferred the light and flavourful Thai green curry for the hot sunday afternoon though. a large number of the starters were deep fried. considering we had a lot of us were in our 'watch what you eat' age group, it would have been nice to have more off beat yet healthy food options. the gorgeous women who each represented their batches and helped bring the event together; the class representatives and the organisers. This fiesty young lady was from the batch of 1957 and was aptly gifted a wine bottle, for aging well. There has got to be a story behind the alumni being called the 'old girls' association. Iguess they mean , no matter our age, we will always remain girls! yes, there was a props photo booth , and it was fun to take pics with my mum's friend Zai aunty from the batch of 73. The batch of 1973 proving that girls just wanna have fun. reunion events like this help bring memories into perspective. What did most of these ladies who were now wives, mothers, grandmothers and even great grandmothers remember from their school days? They rememebered the time the matron shook her by her shoulders till every bone in her body rattled, the time one of them got sent out of class, the time the 'boys' visited, the time they had the socials, the basket ball matches, their houses , their friends and foes, some of their teachers. None of them spoke of mark sheets and exam results. sure, these also are part of our memories but not the kind that make for great stories. birthdays ; they teach you to not only make great memories, but make a story worthy memory.